FORGET $65 MILLION! IS PACQUIAO AND BOB ARUM PASSING UP A $75 MILLION OFFER? Forget what you may have heard about Floyd Mayweather and a $65 million offer from Singapore, or Manny Pacquiao and a $65 million offer from Mexico. Sources have informed FightHype.com that on Friday of last week, Top Rank Promotions received a Letter of Intent from an interested party in the United States with an offer of $75 million available to both sides. On top of that, both fighters have been guaranteed $25 million the minute they sign the contract. "We have a $25 million cashier's check ready for them as soon as they sign the contract. We're going to give each fighter $25 million in advance just to sign," stated one source, who contacted FightHype.com over the weekend with the news. Late last week, Pacquiao's promoter Bob Arum claimed that Floyd Mayweather turned down a $65 million offer that was allegedly shopped to him by "legitimate people from Singapore." Speaking to roving correspondent Elie Seckbach, Arum stated, "Recently, as recent as this week, legitimate people from Singapore offered Mayweather $65 million dollars to fight Manny Pacquiao and he turned it down. 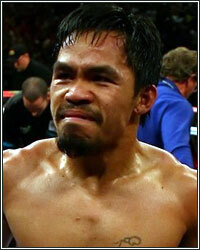 $65 milllion obviously is a sum that Manny Pacquiao would accept, so what does that tell you? It tells you he doesn't want to fight Manny Pacquiao." One day after that, Pacquiao's adviser Michael Koncz would confirm Arum's claims, which should be expected considering that they're both on the same team. "Mayweather wanted the $10 million up front before he would even talk to them," Koncz would tell Ronnie Nathanielsz of the Philippine Daily Inquirer. "He just doesn't want to fight Manny. Where are you going to get $65 million? Even after tax and everything it would come down to $30 or 40 million and that's a lot of money." In other words, because Floyd Mayweather never met with any of these "legitimate people from Singapore", both Arum and Koncz felt compelled to inform the media that he turned down an offer that he never entertained in the first place. Ironically, on the heels of Arum's revelation about the alleged Singapore deal, news broke that Manny Pacquiao was also offered a $65 million deal by Mexican billionaire Carlos Slim. Evidently, a long-time confidante of Pacquiao, Ilocos Sur Gov. Luis "Chavit" Singson, revealed that Slim is extremely interested in having Pacquiao face one of Mexico's rising stars, ideally unbeaten WBC jr. middleweight champion Saul Alvarez, some time next year. According to Singson, Pacquiao is extremely interested in the guaranteed money and negotiations have supposedly already started. Because Bob Arum seems more interested in discussing Floyd Mayweather's alleged offers, however, it's unclear as to whether or not he's currently involved in these negotiations that Singson is speaking of. Whether or not there's any truth to either one of the $65 million stories remains to be seen, however, FightHype.com can confirm that a Letter of Intent was indeed sent to Top Rank Promotions outlining the guaranteed $75 million to both sides. "Yes, we sent the offer on Friday, but haven't heard back from them yet. Hopefully, Bob Arum will present it to Pacquiao soon. From what we understand, Mayweather is available to fight this year, but we don't know if Pacquiao is moving forward with the Marquez fight. I think it's time that boxing fans got the fight we all want sooner rather than later," another source added. With so much bait being thrown into the water, the question is which side is going to eventually bite? As time goes by, there continues to be a growing interest from multiple entities around the world. Last year, it was parties in Qatar and Abu Dhabi. This year, it's been parties from South Africa, Singapore, and now the good ol' USA. For the most part, each time, it's been Bob Arum telling us about it, but each time, the numbers continue to rise. Perhaps Floyd Mayweather wasn't too far off when he once told me, "There's no limit to what the fight can generate, you know? Do I think that I can make $100 million in the fight? Absolutely. If we got the right pieces to the puzzle and the puzzle is put together in the correct way and the correct fashion, I can make some money. I can make $100 million or even more. Like I said before, we know that I can make over $50 million. That's guaranteed. But we're talking about $100 million. Anything is possible. At one particular time, they didn't think I would be able to do 2.5 million homes, but anything is possible. So like I said, we strive to always hope for the best." Considering that Arum just said, "$65 milllion obviously is a sum that Manny Pacquiao would accept," it should be interesting to hear how receptive he will be to a deal worth more.